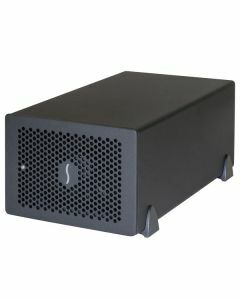 Sonnet’s Echo Express SE III is a compact desktop Thunderbolt-to-PCIe card expansion system that enables you to connect three professional PCIe cards—including video capture, audio interface, SAS or SATA HBA, 16Gb or 8Gb Fibre Channel, 10 Gigabit Ethernet, and RAID controllers—at the same time to any Mac with a Thunderbolt 3 port. Some specialty cards, such as RME’s HDSPe MADI FX card, Blackmagic Design’s DeckLink 4K Extreme, and the Lynx AES16e 50, include a daughter card that mates with and provides additional external connections to the main card. The Echo Express SE III includes two Thunderbolt 3 (USB-C) ports; the first is used for connection to your computer, while the second supports daisy chaining of up to five additional Thunderbolt peripheral devices to a single port on your computer. The SE III includes 10Gbps USB 3.1 Gen 2 support, meaning you can connect a USB device to the second port using the proper cable or adapter. The Echo Express SE III also provides full support for connecting two 4K displays @ 60Hz or one 5K display @ 60Hz. For connected devices requiring extra power, 15 watts is provided to connected bus-powered devices. Smaller than the 3-slot Echo Express III-D - Thunderbolt 3 Edition, the Echo Express SE III is still large enough to support nearly every Thunderbolt 3- and macOS compatible card available. With its three x8 slots, the SE III supports PCIe 3.0, PCIe 2.0, and PCIe 1.1 cards up to 7.75 inches long. To connect the Echo Express SE III to your computer, Sonnet includes a 0.5-meter Thunderbolt 3 (40Gbps) cable, and a Sonnet ThunderLok 3 Thunderbolt connector retainer clip to secure the cable to the Echo chassis. Accidental cable disconnection can lead to data loss. Sonnet’s ThunderLok 3 is easy to install and use—just slide it over one end of the cable, and then plug in the connector and secure it to the chassis by turning a thumbscrew. Because of its unique design, ThunderLok remains on the cable so it won’t get lost when not in use.